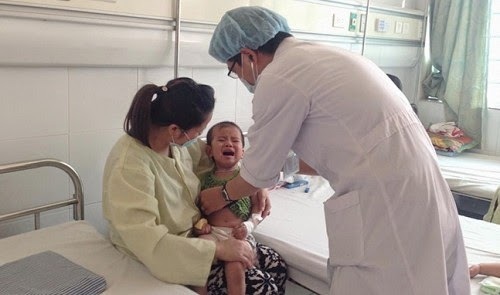 TUOITRENEWS - The number of Japanese Encephalitis (JE) cases has increased sharply in northern Vietnam this month, while the hand, foot and mouth disease (HFMD) is also on the rise in the country’s southern region, health authorities reported. 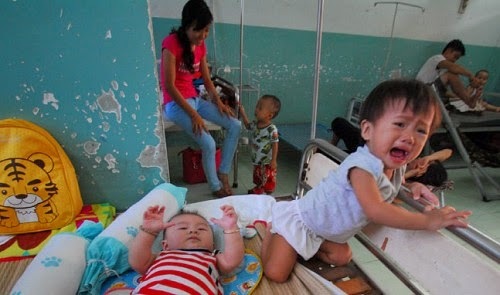 Currently, 10 children with Japanese Encephalitis are being treated at the Central Pediatrics Hospital in Hanoi, said Dr. Nguyen Nhat Cam, director of the Hanoi Preventive Health Center. Since the beginning of this year, the hospital has received and treated 30 children with Japanese Encephalitis. But it is worth noting that up to 28 were hospitalized in June only, Dr. Cam said. Child patients with JE accounted for 20 percent of the total number of brain inflammation cases in children, he added. The JE virus is a mosquito-borne, zoonotic flavivirus that causes encephalitis in humans and reproductive disorders in pigs, said Dr. Bui Vu Huy, head of the Pediatrics Department of the Central Tropical Disease Hospital. The flavivirus affects the membranes around the brain. Most JE virus infections are mild (fever and headache) or without apparent symptoms, but approximately 1 in 200 infections results in severe diseases characterized by rapid onsets of high fever, headache, neck stiffness, disorientation, coma, seizures, spastic paralysis and death, according to the World Health Organization (WHO). JE is a leading cause of viral encephalitis in Asia with 30,000-50,000 clinical cases reported annually, according to the WHO. In Vietnam, when the program of vaccination against JE began being implemented, JE made up as much as 60 percent of the total number of brain inflammation cases. During 2013 and in the first half of 2014, the rate decreased to nine percent, Dr. Huy said. About 2,000 new HFMD cases were recorded nationwide last week, a nine percent increase from the previous week, said the Ministry of Health’s Preventive Health Department. Of these cases, 70 percent were in southern Vietnam, said Tran Dac Phu, head of the department. There are twelve localities with an increase of HFMD cases, including Lam Dong, Ca Mau, Vinh Phuc, Bac Kan, Binh Phuoc, Nam Dinh, Phu Tho, and Hanoi. In the first half of this year, 24,700 cases of HFMD occurred in 62 cities and provinces and two people died of the disease. Compared to the same period last year, the number of HFMD patients went down by nearly 14 percent nationwide, he said. The disease is characterized by fever and rash most frequently seen on the palms of the hands, soles of the feet, and inside the mouth. In Vietnam the most common strain is Enterovirus 71 (EV-71), which causes sores in the mouth and blisters on the hands and feet. The health ministry has recently released the following warnings: the disease can be transmitted through digestive tracts; there are no vaccines or specific medicines to combat the disease; children under five years old are most vulnerable; and the main preventive measures are following hygienic practices in eating, drinking, and living.